As I mentioned before, the last week has been The Week Of Bedroom Reorganization in the Dryer household. Corrie's nursery was turned into a big-girl room (and it's adorable, truly; pictures to follow, at some point). And my three boys decided they wanted to sleep in the same room. Before, Adam (9) had his own room, while Stephen (8) and Joseph (5) shared. But they have begged and pleaded and played the Mom-I-Want-To-Spend-More-Time-With-My-Brother card, which gets me every time. It's not true, of course; they really just think if I reshuffle bedrooms they'll have a shot at new SpongeBob bedding. But a mother can dream. So, all of this to say, we now have three boys sharing one room (the extra room is now the playroom). I explained to them that we can only manage all this togetherness under very specific conditions. I've always tried to keep a handle on all the "stuff" that my kids accumulate, with little success. But I told them that the Days Of Packrat-ed-ness were over. Beginning now. So we implemented a rule that we previously only had in place for Stephen (Packrat King of the Family). It's worked so well for him, I'm hopeful it will help everyone. Each boy now has his own treasure box, about twice the size of a shoe box. All of their treasures (rocks from the playground, a letter from their beloved uncle, unused Chuck E. Cheese tickets and anything else they CAN'T POSSIBLY throw away) belong in the box. When the box gets so full that the lid won't close, it means it's time to go through and throw some things away. I love this, because it teaches them to prioritize and to understand that some things (a postcard from Yosemite) are treasures, while other things (an empty wrapper from their favorite candy bar) are really not. It helps keep loose pieces of clutter contained. And the best part? With their permission, I like to poke through their treasure box. Seeing what they hold dear helps me know them a little better. And no, the little dears didn't get their SpongeBob bedding. They mercifully agreed to this instead. Oh, the cuteness! And the bargain-ness! OH! LAST THING! Don't forget that next Wednesday, February 7, is the Love, Sweet Love edition of WFMW. Details here. I love the treasure box idea! In fact, I want one for myself. :) Oh wait, I have a larger scale version of this with my hope chest. I love the quilts you've chosen! Very nice! Aren't you a mother of chic bedrooms! Love the gorgeous bedding! My kids would be jealous. Shannon this is a fantastic system you have created for the boys...it is neat to see what the kids hold dear isn't it?! heh! I love the "Mom I want to spend more time with my brothers" remark! What a fabulous idea! I definitely think we will need to go get our treasure boxes! i love the idea of seeing what is truly a treasure to them. I know this is next to sacriledge but I'm just not a fan of Sponge Bob. He's just so . . . so . . . annoying. And that's your cue to start throwing rocks. I will have to remember the treasure box idea! How fun-- this is an essay I've been wanting to write for a while, and it could actually get read now. oh shannon!! this was my first time participating and i blew it with my link (other than i think it will take you to my blog and the correct post)...will you (can you?) fix it for me? Treasure box is a great idea. I have used that with my two girls in an effort to keep down all the "extra" stuff we accumulate. I hope I did my links right this was my first time trying a carnival thing on my blog. My boys share a room, too, and their bedding looks amazingly similar to the one you chose. Nice choice! Our extra bedroom is the playroom, too... I don't know what I'd do without a playroom in this house! What a great way to contain the clutter! Love it! And, I think the boys new bedding is great! Have a great day! I like the treasure box idea. My youngest is a pack-rat. He wants to keep every note I have ever put in his lunch box. Sweet, but -- it accumulates into a big pile after so many years! Wow, just think, now you have a whole new room in your house with the playroom! I really like the quilts you chose for the boys' room. I just bought the whole new sha-bang for my oldest DD's room. She wanted horses. Thanks for the great tip! My boys are notorious rock, stick and wrapper collectors. They also have a slew of action figures and "priceless treasures". I'll have to try this one for sure! I love the treasure box idea. Sorry about the double link. I could not delete either one. This is my first time participating so please excuse my mess ups! Since my daughters view this whole house as their treasure boxes, I see I should get heavier on the prioritising idea! Great idea! I've been thinking about using one bedroom as a playroom, too. Terrific idea! I have been wondering how to get a handle on the clutter. We have bits and pieces of stuff lying all over the house. I think my DH and I will also have to be limited to a small treasure box. My youngest daughter saves things like that too-I recently found sticks and some rusty wire where we keep her shoes-and the wire was at her eye level. Thank goodness she didn't get poked with it! I have no idea where she found it. Today is my first time participating in WFMW! I'm not sure if the treasure box or the quilt link was a better idea. We're getting ready to re-do the kids rooms, and POSSIBLY put them all together. Or if not that, at least work towards that. So finding cheap links to bedding is nice. Where did you get your treasure boxes from? Love the treasure box idea. We need to start that for both kiddos. What a great idea!! My nephews have "treasure boxes" at my mom's house -- little drawers in a decorative wooden storage box in the kitchen and I love to look through to see what they've saved over the years. I will have to try this with The Boy when he starts collecting treasures! I love the treasure box idea! Wish I had that growing up because my room was always such a disaster! Right now my boys are only 1 and 3 but I will keep this in mind ad they begin collecting treasures of their own along the way. I love the idea of the treasure box. My son is only 4 now, but one day I'll institute this idea! Thanks for sharing! I love that bedding. We each have keepsake boxes at our house. I had to figure out some way to keep the clutter at bay and keep those truly treasured items safe. Just left my first WFMW! And LOVE the bedding. This is my VERY FIRST WFMW, so I'm excited! I also have a treasure box which I call my memory box and I do the same thing - when it's full, I go through and throw some stuff out. 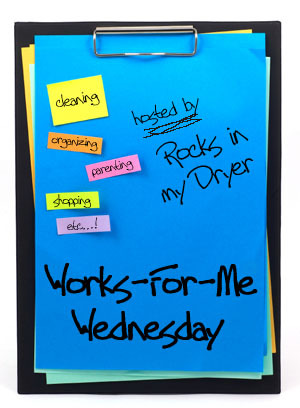 My WFMW is about my daily to-do list. I had memory boxes for my children while they were growing up too. When they left home I gave their boxes to them along with their box of Christmas ornaments that I had collected for them over the years. My youngest son will be married this year so your post reminded me that I better start packing up his ornaments. This is my first WFMW. This is a great idea and I enjoy reading as many WFMW's as I can get to. My plan is to read a few each day of the week. Great idea, getting good ideas! I think your wfmw could work perfectly for my friend Mendy whose three sons collect many treasures. I've been racking my brain for a good Works for Me Wednesday tip, to no avail. Loved yours, though! I saw Sponge Bob bedding at Walmart and was sooo thankful my boys are too young to be into Sponge Bob yet- yikes!! I know you were relieved your boys didn't have their hearts set on that interesting blend of vibrant characters and colors. Great treasure box idea! I love the bedding! I LOVE, LOVE, LOVE the treasure box idea. It gets me out of the whole "saving every package a transformer comes in" too. My 7 yr old loves to save boxes and it drives me insane!!! Off to find a suitable "treasure box". Oh,...great bedroom set choice! It is definitely something they can grow with, much more versatile. I like the box idea as well. Very nice tip! Love the box to hold their treasures idea. I also love the bedding. This will work well for them as they grow, too! Blessings! This is a GREAT idea... I need this one for my dear hubs! This is my first WFMW participation... thanks for hosting it, I have learned tons of hints! My kids love to sleep in the same room too! Sometimes I wish I had a recorder to set up in there so they can remember how much fun they had talking to each other. I love the bedding! And it is a wonderful bargain! I can't believe I forgot it was Wednesday until now! Brilliant idea with the treasure box - we need to implement that here. I have the child who will never throw anything out, too. My mother used this same idea with me and my siblings when we were growing up. As we got older, the smaller box was replaced with a hope chest (for my sister and I, anyway). It really did teach a lot about relative value - what was really important enough to keep and what could legitimately be thrown out. I'm glad for the early lessons because I think it has made it much easier for me to keep a non-cluttered home. I love this idea! Does it work for husbands too? Maybe I should try it. My little one is only 3 months old, but I passed this on to my older sister (who coincidentally is named Shannon) for her 6 and 8 year olds. Shannon, I'm having a little trouble tonight linking right and when I tried to correct it all I did was make it worse. I'm sorry. This is a great idea! I've seen the WFMW meme on my friends' blogs, but this is the first time I've done it for myself! I can't wait to have a chance to read through some of these great ideas!!! I love the treasure boxes! My six year old could use one of those - TOTALLY!! !